The invitation to go on the Firm Foundations course came at the perfect time for me. Krowji had secured the match funding for Phase 2 of our redevelopment project and we were waiting for news of our ERDF bid – we have since been told it was successful! The course is true to its name – designed to enable you to create a solid foundation before embarking on a capital project, there was a huge amount packed into just two days with a good balance of talks, site visits and tasks making it very engaging. 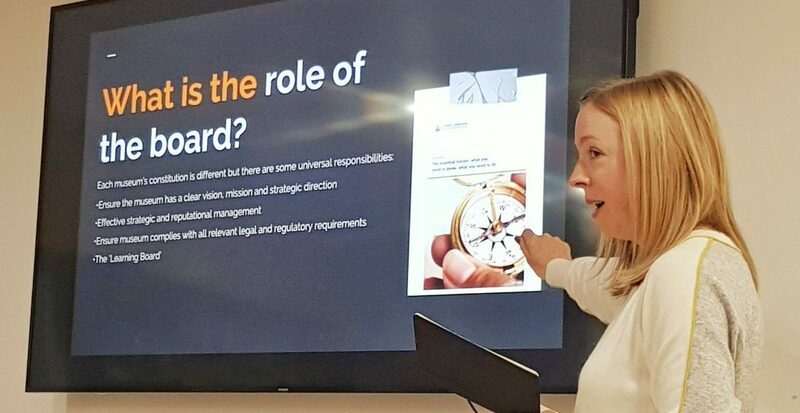 During the first half of the course we were given direct access to an impressive list of experts covering everything from board structure to funding and marketing to risk management. Highlights for me included a talk by Eden’s CEO Gordon Seabright, in which he spoke very candidly about the successes and challenges he’s faced during his time at Eden, and an informal surgery with Phil Gendall of Wolf Rock focussed on creating a clear message in your marketing materials. The risk assessment of preparing and eating a cream tea was also a lot of fun! Firm Foundations has been designed for small groups of delegates in order to create an open, honest and safe environment in which to share experiences and ask questions. It’s relevant to all levels so there’s a good mix of people who have worked on capital projects and those who have never done anything like this before. CMP have generously paired each of us with a mentor, one of their team of experts, so that we are supported in the months between the two halves of the course – an invaluable resource which I intend to make full use of. I’m now very much looking forward to diving into second instalment of the course come February, in particular attending an exclusive evening with Jamie Fobert over supper at the Tate! Delegates from across the South West gathered for the first session of the much-anticipated Firm Foundations Programme to learn from expert speakers and share valuable information and advice about how best to approach capital projects. The Heritage Lottery Fund (HLF) has awarded £7.6 billion to over 40,000 projects since 1994, and will continue to award £300m a year in new grants through to 2019, however the pot is shrinking in real terms and as a result competition is increasing. HLF is looking for projects that focus on heritage, people and communities, and are actively engaging with people. A range of HLF grants are available, from £3,000 up to £5 million. Most relevant for capital projects are Our Heritage; Resilient Heritage, Heritage Grants and Heritage Enterprise: each has a different application process with different timescales attached. Regardless of which programme you choose, you must focus on the outcomes of the project – for people, heritage and communities. What is assessed on making an application? What is the heritage focus of the project? What is the need or opportunity that the project is responding to? Why does the project need to go ahead now and why is Lottery funding required? What outcomes will the project achieve? Does the project offer value for money? Is the project well planned? Is the project financially realistic? Will the project outcomes be sustained? Your answers will inform – and strengthen- your application. The application process itself will take longer than you think, and its important that you plan for this. 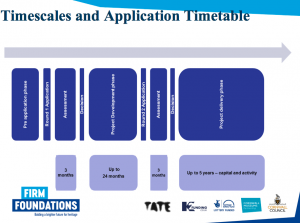 By looking at the diagram below, you can get an insight into how long a typical Heritage Grant application can take. HLF will ask you to make a contribution towards your project. This is described as ‘partnership funding’ and it can be made up of cash, volunteer time, non-cash contributions, or a combination of all of these. More information on this is available on the HLF website. If you are interested in HLF funding, the first step is to have a look here – ‘looking for funding’. Then take a look at the guidance notes as this sets out what HLF fund, the outcomes HLF is looking for and advice about how to make an application – it’s really surprising how many people haven’t done this before they make an application. If you think your project is a fit, then seek early advice from HLF. Submit a project enquiry form and start the conversation – you don’t have to have everything fully formed! For more information on how the Firm Foundations Project can help your capital project, please contact the Cornwall Museums Partnership Office on 01209 500750.